The precious time you have to spend on vacation should be enjoyed in a place that helps you unwind and disconnect from the stress you have in your daily life. When you are here, there should be no such thing as alarm clocks and regimented schedules. Instead, you should be allowed to sleep in as late as you want and plan your days as they come. That is why we recommend staying at one of our log cabins during your vacation. Not only are these rentals the perfect place for you to kick your feet up, but they truly feel like a home away from home. There is no denying the relaxing atmosphere found inside our log cabin rentals in Sevierville TN. From the warm stained walls to comforting decor, you will be hard-pressed to find a more home-like place to stay when you and your family are on vacation. While some people think of a rustic escape when they imagine a log cabin, our properties come with all of the conveniences of home. In fact, you will be surprised to see just how many modern amenities we are able to fit inside each of our log cabin rentals in Sevierville TN. From full kitchens, to private bedrooms, to in-cabin laundry, these rentals have everything you need to feel relaxed and cozy during your trip. What makes these cabins even better is they also offer a variety of luxury amenities that you cannot find with other lodging options. Cabins with state of the art theater rooms and fun game rooms are sure to be a hit with your family! It is impossible to talk about our log cabin rentals in Sevierville TN without mentioning the scenic views that these vacation homes offer. Whether you prefer to spend your days staring out at the rolling mountains in the distance or gazing out at a thick forest of trees, our log cabins have you covered. Being immersed in the area’s natural beauty is is much better than other lodging options that have you staring at neon signs or tall buildings throughout your vacation. Last, but not least, we love our log cabin rentals because they are very affordable. No matter what your vacation budget is, you can spend a relaxing night or two resting in the comfort of one of these vacation homes. Some of the best ways to save money during a cabin vacation include preparing meals in your fully furnished kitchen and splitting the cost of renting a large cabin amongst friends or family. Heritage Cabin Rentals also offers wonderful specials throughout the year that make our cabins even more affordable. 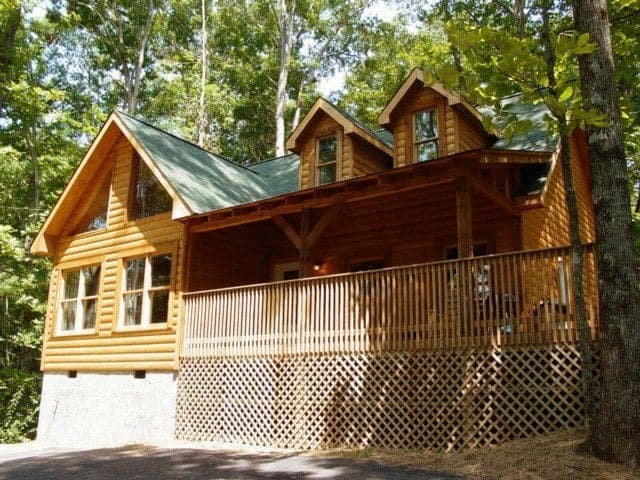 To start planning your next getaway, browse our complete selection of log cabin rentals in Sevierville TN!